Gudy Van Poppel (POPL-custom) creates blades from the 90s, ranging from swords, fixed blade knives to folding knives, and he is a bladesmith whose skills are recognized internationally. He started many collaborations over the years, and among them the one with the Chinese company WE Knife for the production of his Ferox model. The knife, of which we have a preview prototype, will be presented and released during the Bladestock 2018 (an event to be held on June 30th and July 1st in the Netherlands) and will carry an MSRP of $348. The Ferox is characterized by a wide clip-point blade with a pronounced swedge, and has a length of 92 mm, a width of 31 mm and 4 mm of thickness. 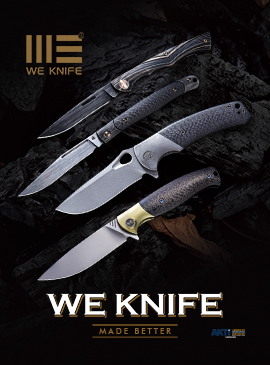 The steel used is the M390, the third generation powder steel produced by Bohler and well known to knives fans because it is able to give excellent edge retention, excellent corrosion and wear resistance. The blade rotates on ceramic ball bearings around a pivot marked with the WE Knife logo on one side, and on the other side has the adjustment / disassembly screw which in this model is T8 torx blue color (like all the other screws on this model). The blade opens with the flipper system, which is the only way to open the blade in this model. The flipper-tab is decidedly large and protruding, comfortable to operate, and when the blade is open it serves also as a guard. The blade, once opened, is firm in position without any kind of play and all the mechanical couplings and workmanships are made to perfection. The Ferox has a frame-lock mechanism, whose locking bar (understandably wider than usual given the size of the blade) is obtained on the titanium frame and is equipped with a steel insert that acts both as an interface with the blade tang and as a system to avoid the hyperextension of the spring in closing phase; moreover, a ceramic detent ball is housed on the insert. 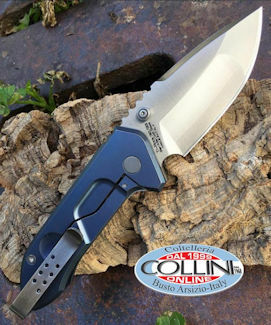 The handle consists of two sturdy 4 mm thick titanium frames with a very fine gray anodized stonewash finish with bronze undertone, separated by a spacer also in titanium with the same finish, as well as the pocket clip that is placed in the tip-up position only. Being a prototype, we have not tested the cutting skills of the knife from the qualitative point of view so we could only focus on an analysis of the tool from the aesthetic and ergonomic point. The Ferox is definitely a big and bold folding knife, compared to the design to which the WE Knife has accustomed us, but despite its weight of 207 g the handling is positive. The grip on the instrument is comfortable and the handle is well designed from an ergonomic point of view; furthermore, the low-profile pocket clip that follows the curvature of the handle does not cause any discomfort to the hand, even with a firm grip. Overall, the FEROX from the point of view of the concept has all the credentials to be a tactical hard use knife; the models in production, unlike the prototype, will also have a light texture on the titanium handle to improve grip and the blade will have a apocalyptic stonewash finish.